As we all have been standing still at, in July the warm and sunny days continued. And manyfold have been the writings and conversations around us with concerns regarding the significance of these high temperatures, of climate change. And whilst in itself this weather of course also impacts the workings of our cooperative, and gives food for thought regarding directions to take for us, we also stand firm amidst the increasing recognition of the fact that it is sustainable organic small scale cooperative production, which in many ways is not only a strategical element of adaptation, but also of mitigation when speaking of climate change. The beautiful strawberry red continued in our bags during July, and we spent a good number of days on the fields together during the weekends, but also during foodbaggs days. 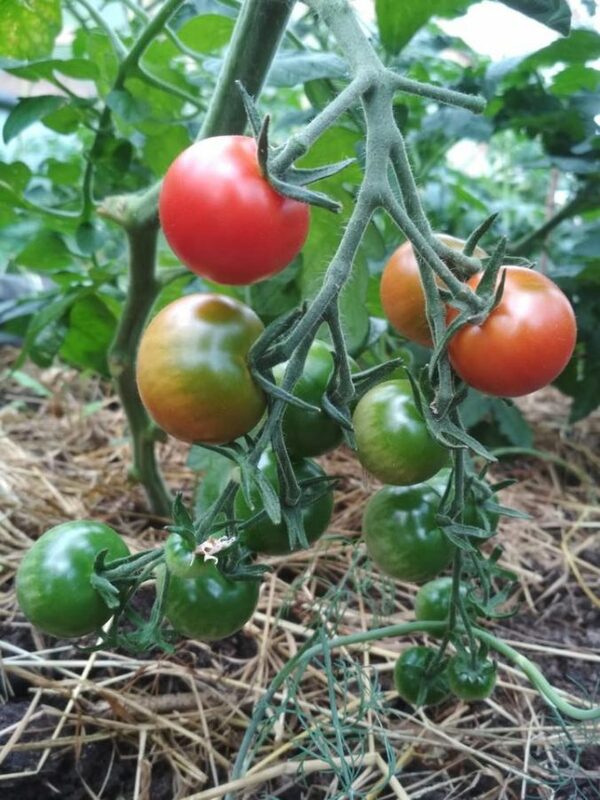 Red also coming from our very first tomatoes in the foodbaggs in July! As well as from our radishes and cherries. At some point the strawberry delight ended, but only to give way for black currants, as well as potatoes from our very same and beautiful Oma Maa cooperative member Kaukon tila. More greens in turn in our baggs came from our first cucumbers! from our broad beans, as well as from our peas. Good work has accompanied the (forthcoming) harvests. So the fields of the radishes, carrots and other root vegetables have been weeded, more salad has been planted, and most of the berries have been cleared in the food forest – surprisingly and wonderfully most of them seem to have been surviving in spite of the heat! On the farm we appreciated to have members with us also during the intensive foodbagg production hours. And at large thoughts have been more developing as to how to have/enable more people engaged on the farm in meaningful and enjoyable activities. A second yoga and brunch was successfully held beginning July, with close to 30 people enjoying the session in a beautiful morning sun on the fields, as birds flew over. The brunch was also very appreciated, and brought up requests to cooking classes on the farm! We will be developing the upcoming ideas further, and as you can see from the below little calendar, for September a Kierrätettyä ja käsintehtyä Lassilan luomutilalla event will take place. This August month we then come to 60 full bag orders, which in practice means 40 whole baggs, and 40 half baggs. Nineteen new try-out members joined for august-september month, and ordered 6 whole and 13 half bags. Our egg orders are pretty much full for the moment. Can you change your Tuesday pick up day to Thursday? Last but not least still the following question : who of you Tuesday people (i.e. you who are currently picking up your foodbag on Tuesdays), would be willing, or perhaps even be glad, to change your pick up day to Thursday?! We are asking this, as there is currently a big difference in the number of bags to be produced for Tuesday compared to Thursday, with food bags produced on Tuesday almost reaching 40. The issue is that if we get above 40 bags for a certain day, we need to turn for instance the oven twice for one bread kind, which of course has its impact on our timetable etc. Therefore, as long as we are below 80 orders, it would be better if we can more evenly distribute the orders for Tuesday and Thursday. Should it be possible for you to switch, do send Ruby a message at jasenet@omamaa.fi! Thanking! You can sign up, offer or find a ride via the following talkoot form (link to that in the email version of this newsletter). You will note that on the talkoot form, you are also able to engage in a variety of Oma Maa promotional activities. You would be most welcome to engage also in that way in taking our coop forward! Hoping to greet all of you sooner or later on the farm!